Richter’s performances of Bach are rare and exquisite jewels indeed. He possessed exactly the right degree of intellectual command and technical control to liberate the ghost from the machine and the results are never less than satisfying. This recital recorded live in 1991 is typical of Richter towards the end of his career. The playing is patrician and often miraculous, particularly in the 4 Duets, but the visceral element of showmanship, so often the raison d’être of professional music-making, is almost entirely absent. Instead, there is a tangible sense of communion between musicians and listeners that seems particularly appropriate for Bach. Richter does not make the mistake of attempting to turn his concert grand into a harpsichord, instead he subtlety uses all the resources at his disposal to delineate and clarify the texture. The possession of one of the most glorious sounds in pianistic history certainly helps too. 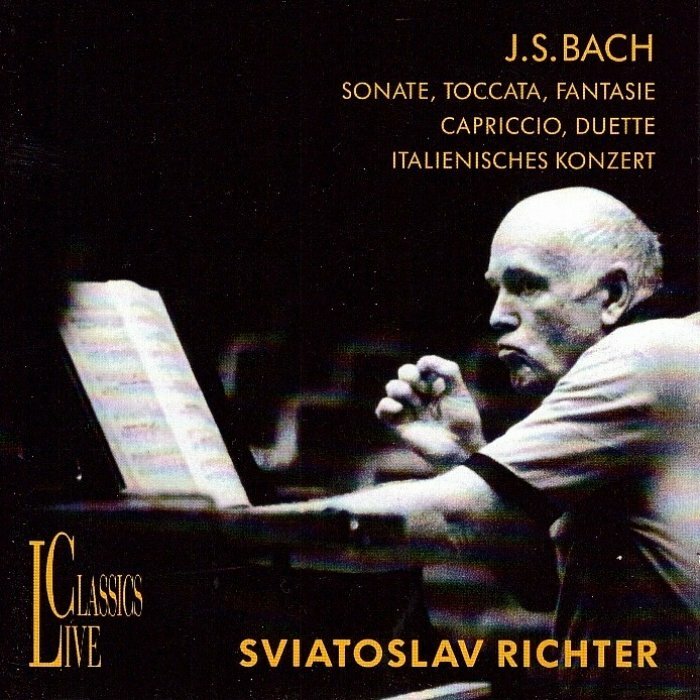 With a pianist of Richter’s calibre, criticism is difficult, although I found some of his tempos a little leisurely – particularly in the outer movements of the Italian concerto. This trait has nothing to do with old age. Even in the 1950s, Richter could be wilfully deliberate. 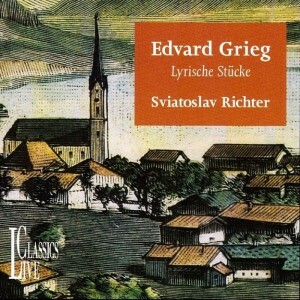 This is a thoroughly recommendable disc in excellent sound but one clearly aimed at Richter devotes. Richter was always at his happiest, or so he declared, in intimate, out-of-the-way venues. It should come as no surprise, then, to find some exceptional performances on these two discs, recorded during a tour covering the length of Germany from south to north in October/ November 1991. He was 76 at the time, and his playing had been showing signs of stiffening for some years, though more in matters of phrasing than in actual dexterity. But on these occasions there was more than a glimpse of past glories. 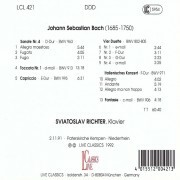 For his all-Bach programme Richter characteristically sought out some keyboard rarities. The D major Sonata is dated in Grove to c1704, when the composer was 18 or 19, and a most intriguing piece it is, with fantasia-like passages linking a stately first movement and two fugues. It receives a full voiced, generously pedalled performance, by no means unresponsive to the quirkiness of what by most yardsticks is a thoroughly un-Bachian structure. I found Richter’s puritanical approach to the D minor Toccata (not the D minor Toccata, of course) and the E major Capriccio harder to take. These both date from around the same time as the sonata, and they would seem to demand a similar improvisatory approach in order to do proper justice to their often unpredictable trajectories. The Four Duets, more usually heard on the organ, are well differentiated here, the first and last being comparatively austere, the second festive, and the third springy and playful. In all four Richter is at his exploratory best. His Italian concerto is solid yet vivacious, with the central slow movement a marvel of self-renewing cantilena – never predictable but always in the gentle grip of a higher logic. 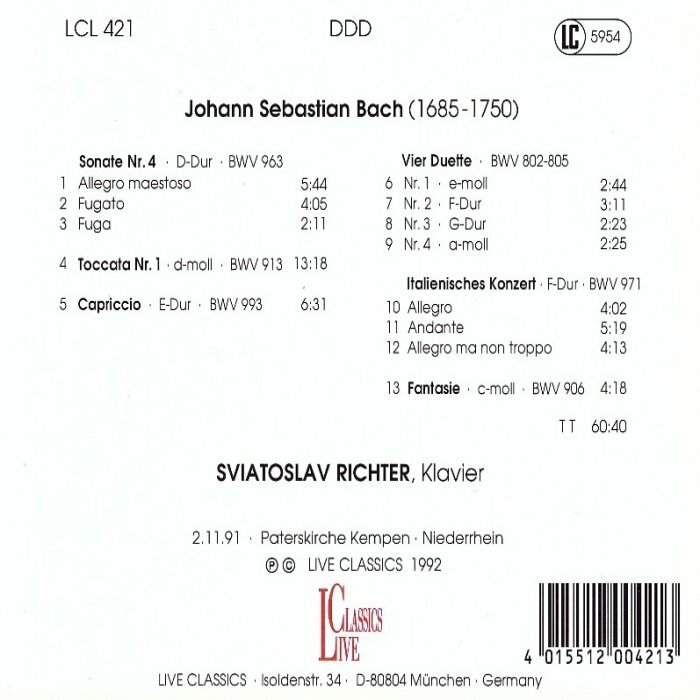 This comes entirely from one recital given in 1991… it’s a pleasure hearing [Richter] play, with tremendous security, through this collection of mostly little-known works, arriving finally at the familiar Italian Concerto. 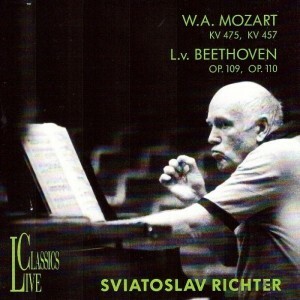 The best-known recording of this work dates from 1948. In 1991 he played just as fluently, and the depth of feeling in the slow movement certainly exceeds what he achieved in the earlier performance. This is thoroughly wonderful playing.